I knew that Asterix had been translated into tons of languages - 114 at last count - but had no idea one of them was Scottish (AKA 'Scots' by Scottish people). 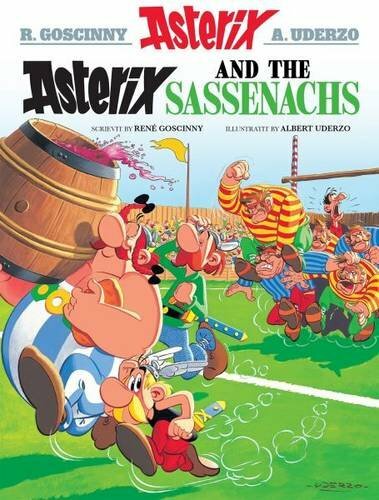 But I was taken aback to see a book on Amazon called Asterix and the Sassenachs. Somehow it works - 'doesnae use his napper' is superb! - it's earthy and colourful and in my imagination the Gauls probably spoke like that, except the Druids, who definitely sounded like the Fremen in Dune. But then I dug deeper and found an article in The National - a Scottish newspaper. It seemed to be about Asterix the Gallus (the first of FIVE Asterix books translated into Scots) but was actually about the Scots language itself. God, it's tiring. It's like trying to read medieval English. Ettled? It could mean a dozen things. I'm too tired to think when I read comics! I work hard, I want to chillax! Leave me alone! Scots reminds me a lot of the Wee Free Men in the Terry Pratchett books (for obvious reasons), except Pratchett never let it get out of hand. I guess what I'm saying is that Scots speakers should remodel their language on a fictional book for children. Actually, that's not what I'm saying, because one of my best friends is Scottish and he campaigned to get a street sign in Zurich changed because it said James Watt was an 'Englander'.